UK tunesmith King Krule (a.k.a. 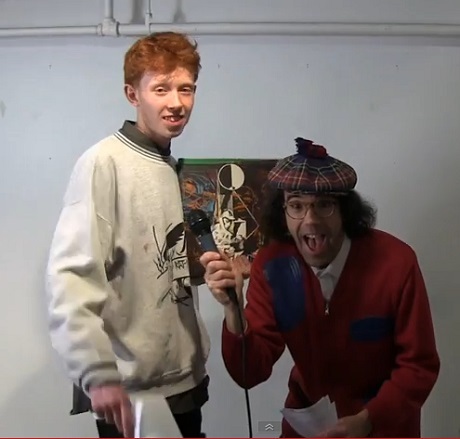 Archy Marshall) has been having a banner year, due to the release of his acclaimed 6 Feet Beneath the Moon, and now he's hit another milestone by yielding an interview with everybody's favourite tam-topped trivia deliverer: Nardwuar the Human Serviette. You know the routine by now. Nardwuar first instigates conversation by gifting Krule an old 12-inch single from rap crew Diggin' in the Crates, wondering whether the Brit will lay down a freestyle on an instrumental beat. He also prods the player on a recent horny appearance on Conan, Scottish post-punks Josef K, and asks the singer to weigh in on an old picture of him and his mates taken in their adolescence. "Why did you do that? Did you go onto, like, MySpace, or something, and print it off?" asks a bewildered but amused King Krule. Always digging up the dirt, you can see Nardwuar's latest interview down below.